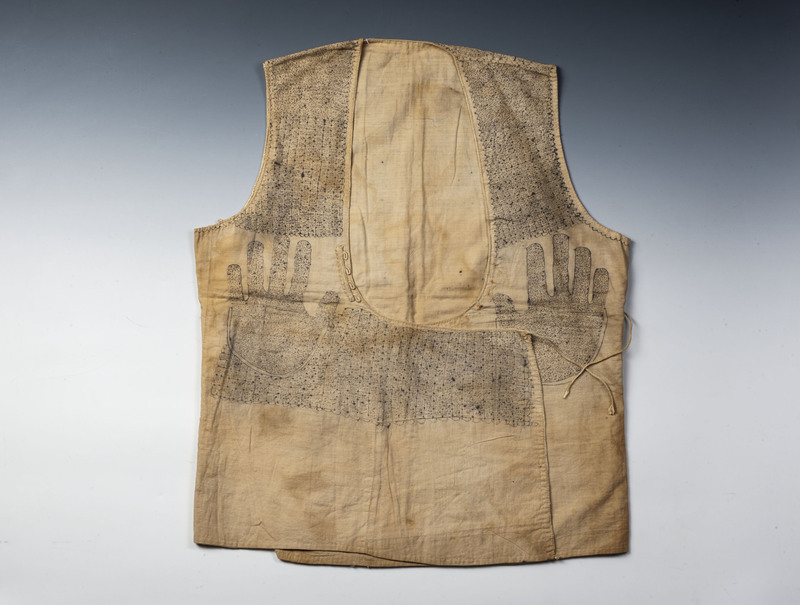 Vest with Talisman, early 19th century , batiste. Similar to most Eastern cultures, the fear of negative forces in the universe and the “evil eye” was also prevalent in Ottoman society. 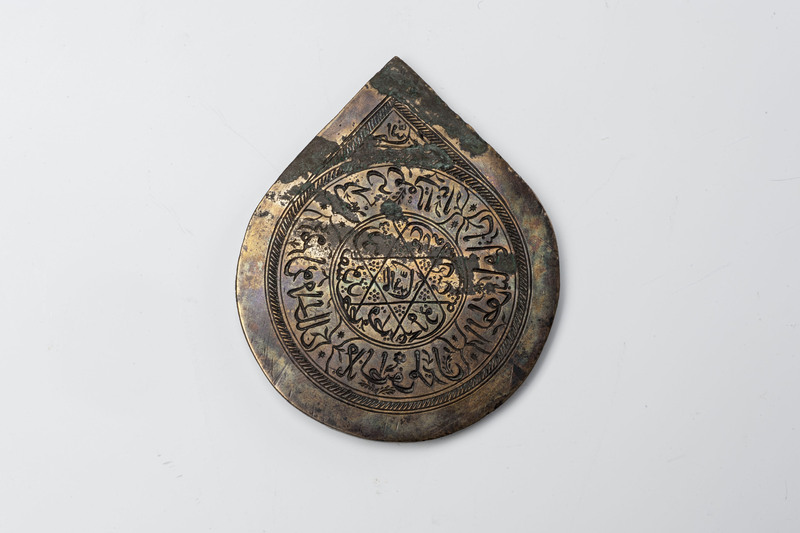 In order to offer protection against such malevolent forces, Ottoman society witnessed the widespread production of calligraphic panels and amulets, as well as “charmed” shirts and kerchiefs decorated with talismanic formulas (wafq) comprised of the names of Allah, the prophets, the angels, as well as abjad, where each of their letters correspond to a number. Seal, late 19th- early 20th century, brass. 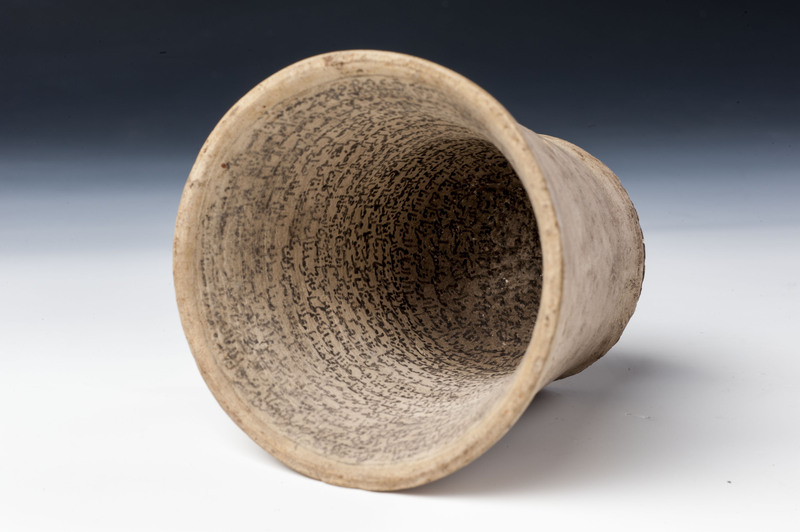 Cup, 19th century, terra cotta. 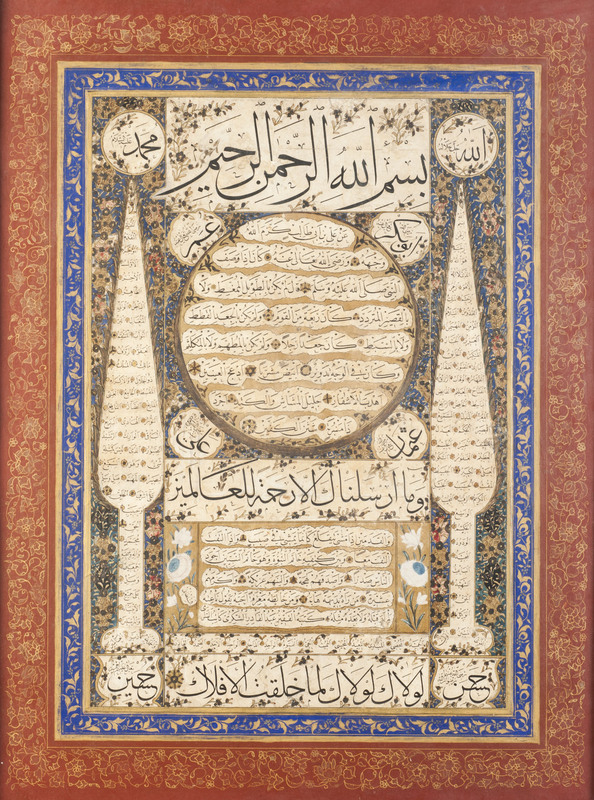 Created first by renowned calligrapher Hafız Osman (d. 1698) in the 17th century and describing the physical appearance of Prophet Muhammad, the calligraphic panels known as hilye-i şerif or hilye-i saadet, on the other hand, were considered a protection against all sorts of evil and particularly against fires in İstanbul, and thus assumed their places on the walls and cantilevers of homes. The panels, which can be regarded as an “abstract portrait” of the Islamic Prophet, were decorated in various styles of illumination in accordance with the changing aesthetic taste of the periods in which they were created. Hilye-i Şerif, Abdülkadir Şükrî, late 18th century. Paper, ink, illumination paint, gold. İstanbul Araştırmaları Enstitüsü 10 Yaşında!